Programming of CNC Machines, 3rd Edition, is written in simple, easy-to-understand language by skilled programmers with years of experience teaching CNC machining to the industry and in formal education settings. This new edition provides full descriptions of many operation and programming functions and illustrates their practical applications through examples. It provides in-depth information on how to program turning and milling machines, applicable to almost all control systems. 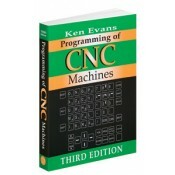 Programming of CNC Machines, 3rd Edition keeps all theoretical explanations to a minimum throughout so that they do not distort an understanding of the programming. And because of the wide range of information available about the selection of tools, cutting speeds, and the technology of machining, it is sure to benefit engineers, programmers, supervisors and machine operators who need ready access to information that will solve CNC operation and programming problems. This 3rd edition of an already proven text offers detailed coverage of subjects not addressed by the majority of existing texts. • Contains expanded sections on CAD/CAM and Conversational Programming that offer insight into the modern methods of CNC programming. • Includes a modern CNC controller representation in the Operation Section. • Thoroughly describes mathematical formula usage necessary for creating programs manually. • Provides practical examples and study questions throughout, allowing users to demonstrate their proficiency. • Features improved blueprints and drawings created to ANSI standards in order to improve clarity. • Offers a glossary of terminology and useful technical data and charts needed for effective programming. • Illustrates how to create each programming example through clear step-by-step presentations. • The only textbook that covers edgeCAM CAD/CAM Programming. Project Lead the Way (PLTW) has adopted edgeCAM as the CAD/CAM program they use in their Computer Integrated Manufacturing (CIM) courses taught at high schools across the nation.